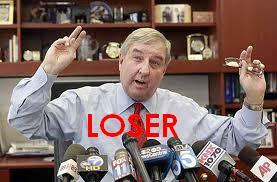 Steve Cooley Lost the Election for State Attorney General! 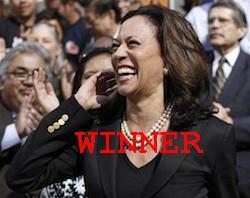 San Francisco District Attorney Kamala Harris (Democrat) took home the VICTORY! It took a full 3 weeks to get the final results & boy oh boy was I relieved, excited, ecstatic & full of laughter all in one! I think I did a flip when I learned this Great news. What makes this such a funny story to me, is the fact Mr. Cooley, the egotistical & arrogant man that he is, declared Victory on election night. Giving us an early victory speech only for him to wake up the next morning & see he was no longer in the lead. That was so HILARIOUS & a one of a kind move only a man like Cooley could make!!! I’ve never heard anyone give an early acceptance speech only to find out in the end they lost! That must make him feel pretty low as a human being if I must say so myself. And I’d guess he does feel pretty low & that’s why he did not attempt to show his face upon his loss. A man who is quick to jump the gun when he ‘thinks’ he is a winner but hides behind his campaign team when he ‘knows’ he lost tells you the type of man he is! That move alone tells alot about this man named Cooley. He’s just not as COOL as he thought. I bet you do take pride in that Steve. That’s because you help cover-up the wrongdoings of all these rogue cops out here who are running a muck. They all know they can count on you to make sure they never get found at fault for all these unjustified homicides, excessive force cases, acts of misconduct etc. And being you are a crook yourself, who is out here trying to line your pockets at the public’s expense (Double Dipping), you were the man they saw fit for the job…. but THANK GOD you were not selected!!! 🙂 California has spoken! You are now officially a LOSER, Steve! How does it feel to know you couldn’t pull this win even though you were very confident you could?? I’m curious. CALL TO ACTION: Justice For Mitrice Richardson – New Investigation, NOW! Goodbye 2010……2011 Here I Come!!!! ALERT! Inglewood Officer Alvaro Ruiz Seemed to be Following Me! Are Cops More Criminal Than Criminals?